We've already seen the big-nosed front end reveal of the 2009 Acura TL, but Flickr user buckeye01 managed to snag a beautiful close-up set of pics while out at the links. We finally get an up-close look at the rear of the new TL and also a peek inside. Unfortunately, all we see in the cabin is some shapely dash elements, and perforated leather seats. At the back we see a pair of dual-quad exhaust tips, huuuuuge bumper mounted reflectors, tasteful tail lights and a nice use of chrome. 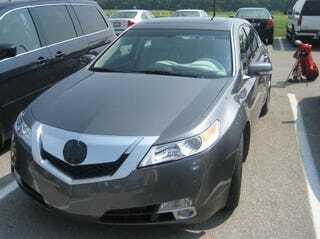 Does that make this the 2009 Acura TL Type-S?